Leslie Shepherd with one of his prize-winning neeps. Echt farmer Leslie Shepherd has been crowned champion neep grower in the north of Scotland. 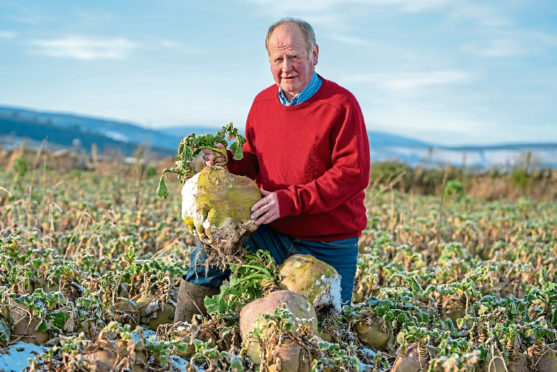 Mr Shepherd, who farms the 480-acre Cowiehillock Farm on the Dunecht Estate in partnership with his son Graham, is the winner of this year’s Royal Northern Agricultural Society turnip growing contest. The competition, sponsored by Sandy Duguid, of Murray Duguid Seed Merchants in Oldmeldrum, attracted 33 entries from Nairn in the north to Laurencekirk in the south. The judges – Sandy Duguid, Ian Moir and Graeme Christie – awarded the overall champion title to the Shepherd family’s 7.5-acre block of Kenmore, which achieved a yield of 68.39 tonnes per acre. The crop came out top in the Less Favoured Areas (LFA) and feeding sections. He said the neeps were grown for feeding lambs. The family fattens around 1,200 lambs every year as well as running a 180-cow suckler herd. Reserve overall and the prize for the best yield in the contest went to a crop of Airlie from Keith farmer Billy Stewart of Bomakelloch Farm. His entry achieved a yield of 70.72 tonnes per acre. Other prize winners included the best non-LFA crop to an entry from C T Seivwright & Sons, Hillend Farm, Fordyce. The shopping category prize was awarded to an entry from A M & A J JAcobsen, Grange of Kinneff, Inverbervie. The prize for the best entry from someone under the age of 30 went to a crop of Triumph from Liam Wink of 4 Richmond Terrace, Rhynie. The best management prize was awarded jointly to Mr Wink’s crop of Triumph and an entry of Lomon from J & E Forrester, Aldie Farms, Cruden Bay.